THIS IS A KABUBBLE "POP" CARD. Print this page, and then follow these instructions: 1. Cut out card INSIDE of red square. 2. Fold on the vertical line that runs through the blue/duck bow tie. 3. Partially cut around the blue duck bow tie so it will pop-up later. but DO NOT CUT BETWEEN THE 2 SMALL LINES ON EACH SIDE OF THE BOW TIE. 4. Open the Bow Tie so the card is flat. 5. Now fold the card on the horizontal line that runs between the two Ties. Make certain to let the Blue Bow Tie "POP" out. 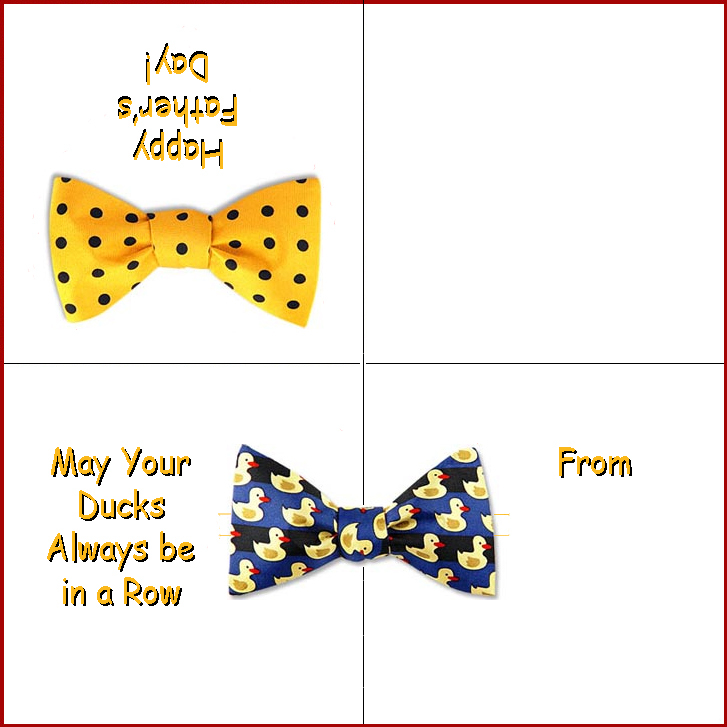 Now you're ready to sign the card and give your Kabubble Father's Day Bow Tie Card to your Dad!